According to T.D. Jakes and many others, the Fireproof movie was going to have a strong and powerful message that could stem the tide of divorce in our country! He urged everyone to see it. Since then a significant number of others have enthusiastically promoted Fireproof. I had serious doubts before the movie and had a lesser opinion after seeing the movie. Find out why. In Shepherding a Child’s Heart (SCH), one of the things Dr. Tripp strongly emphasizes is the authority of the parents. That's not problematic. What is a problem in my opinion, is that there is an unhealthy, unbiblical, and unbalanced emphasis on authority and obedience. Apparently, this is because he believes most parents, including Christian parents, do not know they have parental authority or have not exercised much of it. 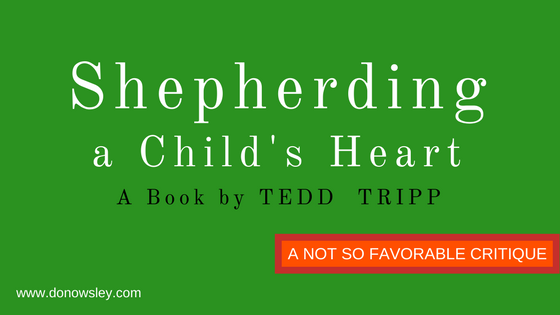 This is a basic critique of Tedd Tripp's popular book, Shepherding a Child's Heart. It presents an overview of some of the positives and negative in the book. I've written follow up articles, addressing several key themes with which I find problematic. Perhaps, they will be posted. We will see. Shortly after Shepherding a Child’s Heart (SCH) came out, quite a few people highly recommended it. I bought it, read it, and then also promoted this “must read.” That was back when my views on rearing children tended to be in sync with what is considered the traditional Christian model for parenting. So, Tripp’s book supported my homeschooling, somewhat negative, fundamentalist, paint-by-numbers parenting paradigm. After a number of years, my wife and I became stumped why Tripp’s model and methods did not work with our younger child (I’ll call her C). Neither did a few dozen other books like his. We believed that this model and these methods were straight from the Bible and we had to apply them or be in sin. That perspective was predominant among many people we knew in the homeschool groups and churches, so the pressure was on to conform to “God’s way of parenting.” At that point, and because of the urging of a number of folks, I reread Shepherding a Child’s Heart. Surely, I must not have understood it the first time and did not correctly apply what Tripp said. Right? Nearly ten years of practicing this “biblical approach” and seeing that it only exacerbated the wild behaviors of our adopted child, we began to search out other counsel. The relationship between us and our child was deteriorating. What’s more, some within our church and school community became hostile toward us for not doing the parent thing right. A number were quite cruel toward our child. A few even considered her to be demon possessed. They said we were not strict enough, spanked hard enough or long enough. If they only knew. The final straw that broke our camel’s back was when the leadership of our church declared we were bad parents, I was a permissive and bad father, and the problems with our child were because we were not doing the right things (spanking, scolding, rebuking, bringing harsher consequences, breaking her will and breaking her spirit). They were fully convinced of their position because I refused to obey their command to lock our child in her room for a year with bars on the window and a barred door, and only her mattress, pillow, and blanket. Not obeying their command meant I was rebellious, so my rebellion apparently influenced the child in a bad way. At that point, our perspective began changing. Was this “paint-by-numbers” approach really right? With all the talk about becoming Christians by God’s grace, wasn’t this “biblical” approach doing heart work by law, rules, and spanking? In short, it seemed that there were two ways to turn a child into a Christian: see him turn to Jesus by faith or spank and discipline the right way until he changes. We began to seriously doubt whether God in the Bible even made the claims these parenting professionals said. If these men were right about child rearing and God does command us to parent by this model, then we would accept and apply it all. However, we were no longer seeing it that way. We became convinced we had to err on the side of grace, kindness, and understanding (not to be confused with permissiveness or passivity). Since their “God way” of discipline was not helping, what would? Our changed viewpoint became a big source of conflict with people and leaders within one church I pastored and at the private Christian school. That led to shunning, ridicule, and condemnation by the influencers. It became too much. We were told and shamed into believing we were horrible failures as parents and that we were the cause of our young one’s challenges. Was that true? Only, if you believed their assertions. We had to leave that particular church and school community. Through a very horrible event, we ended up getting help from “worldly” counselors. It turned out that our child had, and still has, Reactive Attachment Disorder (RAD). At first, this diagnosis was hard to receive because of our disdain for the field of psychology. Yet her behaviors fit every characteristic in the profile for children with RAD. While we had no answers before, this helped explain so many things. We learned how the impact of severe neglect and abuse upon C in her first few months of life seriously affected her brain, body, and soul. From that moment of discovery, everything made sense to us about C. After holding onto these “biblical” views on child discipline for nine years with our older child and then another ten years with C, we experienced a paradigm shift. If you’re interested, you can read about this changed perspective on my blog, Our Planned Parenthood. Now that we are raising our grandson, several people have suggested we read Shepherding a Child’s Heart. We appreciate the concern but we respond that we have read it and would not recommend it. That, of course, provokes the question why. So, I reread Tripp’s book for a third and fourth time and am even more convinced I would never recommend it. I do not doubt Dr. Ted Tripp is quite sincere in his faithfulness to Jesus and the Bible. Nor is there any doubt he desires the best for children and their parents. So, it is not my intent to impugn Dr. Tripp. It is my intent to show why I could not commend his Shepherding a Child’s Heart (SCH). Here’s my review. Warning: It is a critique not altogether favorable. Allow me to start by evaluating the book as I do with my university students’ papers. The development of his thesis is supported primarily through personal examples and experiences, some Scriptures, and a few ad hominem arguments. His personal assumptions are evident and presented in a manner that his teaching is decidedly right. There is no attempt to critique his own perspectives or even answer skeptics. It seems like the book does not allow for alternative perspectives. For example, the few times he discusses other positions on child-rearing he does so with ungracious condescension. The book is readable but it lacks clarity and cogency. In my first reading years ago, I found it to be convincing and correct. This is because the book authenticated my immature and somewhat fundamentalist understanding of child-rearing. Now, after many years of experience and study, I no longer hold that opinion. SCH is orderly but redundant, interesting but not at all profound. Shepherding a Child’s Heart is relevant and has been since it was written. And why not? Parenting is always a timely subject. In my four readings, I cannot say the material was ever insightful. It is written to be applicable and makes an attempt at showing how God’s Word can be applied to disciplining children. At the same time, while it could be said that his presentation is consistent with a biblical perspective, it is certainly not the only biblical perspective as sometimes implied in the book and often times stated from the book’s supporters. For me, the provocative thing about the SCH is that it infers the author’s position is the singular biblical teaching on child rearing. SCH is an integration of his faith, worldview, and a few scriptures. Sometimes, Dr. Tripp takes the original principles of a biblical text, called the interpretative application, and applies them. That's always a good thing. Most often, the effort is muddled or insufficient. It is easy to argue that he fails to take into consideration the whole Bible in order to bring God’s thoughts in the discussion in a way that reflects biblical reality and the whole truth. While the Bible has only a few passages to express parenting methodology (see my blog post Everything the Bible Says about Raising Children) so much more needed to be said by comparing scriptures with scripture. As SCH says, there are two main ways to rear children: communication and using the rod (spanking). This may be true if we ignore what the Bible does say about numerous, very relevant and important subjects. Topics such as biblical anthropology, fathers, mothers, different ways to communicate and teach truth, the vast number of modes for discipleship, the many facets of discipline, and the role of God’s Word and Spirit in the family and child-rearing. All these should be explored, considered, and to some pertinent extent be brought to bear on the topic. In this regard, the book is deficient. First, at its core, SCH seeks to bring to the forefront of a parent’s mind that discipline must flow out of guiding a child in the way of God as revealed in the Bible. It is of utmost importance for parents to point children toward a righteous and holy God. This is made clear in several places, such as this comment: “One of the most important callings God has given parents is to display the greatness, goodness, and glory of the God for whom they are made” (Kindle Location 45)[Note: future page references from the Kindle edition will be cited as KL]. With that as the foundation for parenting, Tripp says, “Let me overview a biblical vision for the parenting task. The parenting task is multifaceted. It involves being a kind authority, shepherding your children to understand themselves in God’s world, and keeping the gospel in clear view so your children can internalize the good news and someday live in mutuality with you as people under God” (KL 138). Genesis 18 calls fathers to direct their children to keep the way of the Lord by doing what is right and just. Being a parent means working in God’s behalf to provide direction for your children. Directors are in charge. It involves knowing and helping them to understand God’s standard for children’s behavior. It means teaching them that they are sinners by nature. It includes pointing them to the mercy and grace of God shown in Christ’s life and death for sinners (KL 664). [T]o embody the process of guiding our children. It means helping them understand themselves, God’s works, the ways of God, how sin works in the human heart, and how the gospel comes to them at the most profound levels of human need. Shepherding the hearts of children also involves helping them understand their motivations, goals, wants, wishes, and desires. It exposes the true nature of reality and encourages faith in the Lord Jesus Christ (KL 1607-1608). ‘He used to knock me around once in a while. I didn’t like it, but I turned out okay.’ What has this parent done? He has unquestioningly accepted and employed the same method of childrearing his parents used. He has not assessed whether it was biblical. He has not assessed whether it had a good impact on him. He has simply drawn from his survival the implication that it wasn’t that bad (KL 1095). From these basics come Tripp’s methods. There are misapplications of the Bible. He presents the material with an either-or, black or white mentality. The book has an unbalanced emphasis on authority and obedience. SCH tells parents they must know their child's heart (when they really can't). It offers a narrow interpretation of children's behaviors (back to either-or, black or white). Discipline is about communication and spanking (when it's much, much more). These are the key areas I might write about in future posts. In any case, they are six of the several reasons why I believe there is more negative about the book than positive and therefore not valuable enough to commend to others.